Introducing Fresh Wave Lavender Odor Removing Packs: The same odor removing power of Fresh Wave, now infused with lavender oil. Known for its calming properties, the addition of lavender gives a boost to the trusted Fresh Wave best sellers. Now you can remove odors with lasting, relaxing lavender essence. How to Use: Toss one in a small space or stick in place using a Fresh Wave Fresh Pod. Notice big-time odor removal. Do a happy dance. 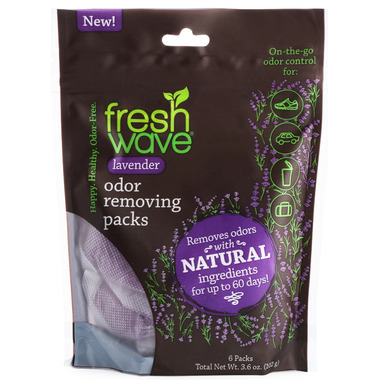 Fresh Wave Lavender Packs will remove odors for 30-60 days! Simply reseal this bag to keep the other Lavender Packs freshtastic! Each bag contains 6 odor-removing Packs. Ingredients: Water, Plant Extracts & Plant oil.